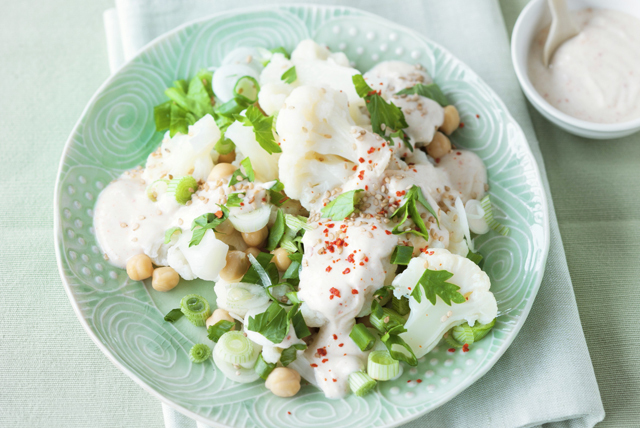 The creamy homemade yogurt dressing served over this cauliflower and chickpea salad is sure to have you coming back for more. If you're looking for a great veggie side, this is the one! Try this delicious cauliflower salad recipe today. Cook cauliflower in boiling water in large saucepan 5 min. or until crisp-tender; drain. Rinse with cold water; drain well. Place in large bowl. Add chickpeas, onions and parsley; mix lightly. Mix remaining ingredients until blended; drizzle over salad. Add 1 minced garlic clove to dressing mixture before drizzling over salad.